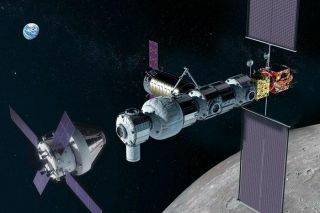 Artist's illustration of the Gateway, the moon-orbiting space station that aims to begin building in 2022. On Tuesday (March 26), Vice President Mike Pence instructed NASA to put astronauts on the lunar surface by 2024, four years earlier than previously planned. Such urgency is required to safeguard the country's leadership and dominance in space, Pence said. "The United States must remain first in space in this century as in the last, not just to propel our economy and secure our nation, but above all, because the rules and values of space, like every great frontier, will be written by those who have the courage to get there first and the commitment to stay," the vice president said during the fifth meeting of the National Space Council, which he chairs. NASA Administrator Jim Bridenstine voiced confidence that the 2024 goal is achievable. So did aerospace firm Lockheed Martin, the prime contractor for Orion, the crew capsule that NASA astronauts will ride toward the moon and other deep-space destinations. For example, Lockheed representatives said the company could build a crewed lunar lander relatively quickly, by leveraging technologies developed for Orion. This lander could touch down by 2024, provided it departs from an "early version" of the Gateway, the moon-orbiting space station that NASA plans to start building in 2022 as a fulcrum for landing operations. "This approach delivers an earlier landing capability featuring reusable technology that also lays a foundation for a future expanded, sustainable human presence at the moon," Lisa Callahan, vice president and general manager of commercial civil space at Lockheed Martin Space, said in an emailed statement. "This is an aggressive but achievable schedule and could be the catalyst to help jump-start a new era of human exploration of the moon, Mars and beyond." And experts who don't have any skin in the game agreed that 2024 is doable. "This was not done casually," said space policy expert John Logsdon, a professor emeritus of political science and international affairs at The George Washington University's Elliott School of International Affairs in Washington, D.C.
"The people at the space council are smart people, and they would not set a date like that without some sense that it was possible," he told Space.com. "I think it's feasible," space policy expert Brian Weeden, director of program planning at the nonprofit Secure World Foundation, told Space.com. However, staying on this ambitious schedule will require concerted effort by NASA, the White House, and the Office of Management and Budget, Logsdon stressed. Callahan acknowledged this reality in her statement, and Weeden made a similar point. "The question has always been politics," Weeden said. Historically, Congress and the White House tend to pull NASA in different directions, he explained, and the agency doesn't have enough money to do all that it's asked to do. So, the executive and legislative branches will have to get on the same page and stay there to make 2024 happen, Weeden said. And NASA may have to adjust its deep-space strategy as well, he added. That strategy involves lofting astronauts using Orion and the Space Launch System (SLS), a giant rocket that's still in development. SLS is scheduled to launch for the first time in 2020, when it will send Orion on an uncrewed test flight around the moon, an endeavor known as Exploration Mission 1 (EM-1). But SLS has experienced multiple delays, so meeting the 2024 deadline may require going with "some sort of commercial solution," Weeden said. Either way, he added, NASA and the nation will likely have to accept some increased risk. "If the goal is to land people on the moon by 2024, that doesn't leave a lot of time to do test flights," Weeden said. "Whether or not it's too risky is above my pay grade. This is a huge debate." Space.com senior writer Meghan Bartels (@meghanbartels) contributed to this story. Mike Wall's book about the search for alien life, "Out There" (Grand Central Publishing, 2018; illustrated by Karl Tate), is out now. Follow him on Twitter @michaeldwall. Follow us on Twitter @Spacedotcom or Facebook.